Wear a piece of Ireland with this beautifully handcrafted Ladies Cashmere Shanagarry Coat by Ireland's Eye Knitwear. This beautiful coat is made up using 95% wool and 5% cashmere and is luxurious and extremely soft to the touch. It has a stylish chunky Cable Knit detailing with 3 chunky button fastening down the center front and a fish tail style finish at the back, a must have for any wardrobe. Ireland's eye always manage to combine tradition with elegance. Available in a selection of sizes and colors. When Ireland's Eye Knitwear started out, it was very much a family business - and that's even more true today. Over the course of the past 40 years, this native Dublin family has worked tirelessly to develop the company into a leading international brand - aided and abetted by a talented and committed workforce many of whom have been with the company in excess of 20 years. The tradition of Irish knitwear is built around individual knitters and small cottage industries, something the family have always tried to stay very close to over the years. This is something that can be seen in the hand-finishing of every single piece they produce. Ireland's Eye aim to combine a classic Irish knitwear look with the best of modern design. 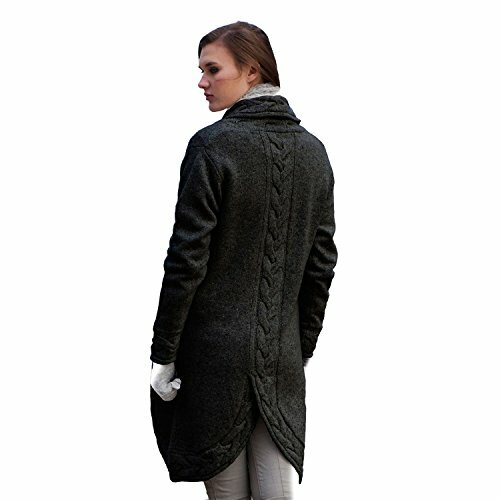 Wear a piece of Ireland with this beautifully handcrafted Ladies Cashmere Shanagarry Coat. This beautiful coat is made up using 95% wool and 5% cashmere and is luxurious and extremely soft to the touch, available in a selection of sizes and colors. It has a stylish chunky Cable Knit detailing with 3 chunky button fastening down the center front and a fish tail style finish at the back, a must have for any wardrobe.